In a study published in the Californian Journal of Health Promotion, researchers examined dietary choices the night of and morning after drinking. The use of alcohol in North America is widespread. This is why the effects of alcohol consumption have been studied for countless years. While multiple publications on drinking and diet exist, there are large gaps in knowledge of how the student population alter their eating behaviours as a result of drinking. Researchers wanted to know why obesity rates in universities were increasing so steadily. With the knowledge that a whopping 65 % of the U.S. student population report that they consume alcohol regularly, researchers wanted to determine if there was a potential correlation between this drinking activity and the 12.5% American obesity rate among post-secondary students. The “drunchies” is a colloquial term for the cravings of sweet, salty and generally unhealthy foods after a night of drinking. As depicted in films, the drunchies are no foreign concept to university students. Senior students usually bestow their wealth of hangover cure knowledge to younglings as a rite of passage. With this activity occurring in colleges everywhere, we need to start asking ourselves how much truth these stories hold and what these supposed hangover cures may have to offer for students trying to recover from a night of intoxication. In the Californian Journal of Health Promotion, a study conducted by researchers at the Universities of Bowling Green State, Buffalo, Michigan and Toledo examined dietary choices the night of and morning after drinking. Researchers from these universities joined together and collected data from students in an introductory psychology course at a Midwestern university that would remain anonymous. Researchers asked these students questions on how drinking affected their eating choices. Students were given extra credit for their participation as well as the option to opt out of the study and do an alternative assignment for credit. All participants’ responses and their enrollment in the study was anonymous. First, researchers separated students into 4 groups based on their first set of responses in the survey. The survey tool QualtricsTM was used, which enabled researchers to have the survey switch to a specific bank of questions tailored to one of the four groups above once a student was categorized into their respective group. The data from non-drinkers would not be included in the study. Survey questions distinguished episodic/heavy drinkers by asking students how many drinks they typically consumed in one occasion. Four or more drinks for females and five or more drinks for males would classify these individuals as having participated in a binge drinking episode. So that people would not be misclassified as heavy drinkers, each question included a definition of what quantity of each class of alcohol was classified as “one drink”. Results showed that, overall, students changed their eating habits both the night of and the morning after drinking. The likelihood of consuming something before bedtime equally increased among all drinkers. Interestingly, researchers’ predictions proved to be correct: in all alcohol-consuming groups, individuals were more likely to consume nutrient-poor or ‘unhealthy’ foods on a night of drinking compared to their usual nights without consuming alcohol. Researchers also examined how big of an impact these changes in eating habits while intoxicated had on each group. Interestingly, among the three classes of drinkers, male episodic/heavy drinkers typically eat the least nutritious food before bed when they are not drinking. Therefore, the effect of consuming alcohol on their diet was not as impactful since they are, statistically speaking, less nutrient conscious to begin with. Researchers not only examined the quantity of food consumed the prior night and following morning after drinking but they also compared the type of foods (sweet, salty, fatty) and the number of meals skipped after alcohol consumption relative to ‘normal days’ without drinking. Among all groups of drinkers, a common trend was that fewer individuals skipped breakfast after a night of drinking compared to a night without, with 3% of individuals skipping meals compared to 14%. Common hangover foods among all groups were salty foods. Unexpectedly, women who were heavy/episodic drinkers also reported eating more fruits after alcohol consumption than they normally would, while males reported being more likely to consume meats and mixed dishes. The fact that males and females favour particular food groups while intoxicated suggest that psycho-social factors like rituals of eating while drinking at parties come into play with nutrition and alcohol on top of the already-present influence of one’s biological factors. 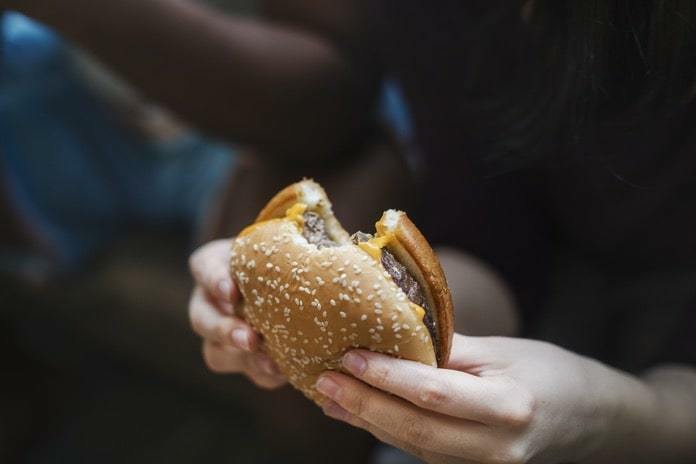 One interesting finding of this study was that, contrary to popular belief, individuals who were intoxicated showed no increased likelihood of buying fast food and that groups who did purchase food from such establishments are individuals who claim to regularly eat from those restaurants. One trend that puzzled researchers in this study was that after participants’ data were collected, it was noted that all groups showed a preference for salty foods when intoxicated. They, therefore, hypothesized that this preference was likely a result of the hangover information passed along the social grapevine within and throughout the college population being assessed as preferences for sweet vs savoury food are usually specific to the individual. Student data collected through the intro psychology course pointed to alcohol consumption is a significant contributing factor to obesity among university students. Researchers also found further information calling for concern – students did not report having increased their water or non-alcoholic beverage consumption on nights where they consumed alcohol to properly offset its dehydrating effects. This showed a potentially greater danger for alcoholic dehydration being exacerbated among student populations. This study taught all academics involved in the curation of knowledge that further exploration in the effects of alcohol on dietary patterns is necessary for future North American students. It also told us that education programs on self-care both during and following alcohol consumption may be required in colleges and universities as students seem to lack the knowledge on how to sufficiently hydrate when drinking. Thanks to researchers at the Universities of Bowling Green State, Buffalo, Michigan and Toledo, the effects of alcohol consumption on obesity rates seem to be less elusive and the importance of further data collection has been supported and prompted.